Our ‘Harvest Festival’ this year is this Sunday 14th October – please bring tins and dried goods to give to Schwäbische Tafel (food bank) which will be collected during the Harvest Thanksgiving Eucharist. After the service there will be a harvest lunch, come hungry and bring a little extra money, if you can, to put in the donation basket for our harvest appeal. Why do some say grace and some don’t ? Why before the main meal but not the rest ? Why at home but not in a restaurant ? What if there are people of faith gathered around the table? You can see why its easy just not to bother ! Here are my thoughts about saying grace for anyone of faith or not…..
– cleaned, shipped, prepared, cooked, served, for our nourishment and enjoyment…. And once again our harvest blessing: may you be blessed, may we all be blessed, and our cups filled to overflowing by a God who promises abundance. I would like to gather together a confirmation group – not urgent, but if you have not been confirmed have a think and pray about this, talk with family/ friends, talk with me….. I am often at the Centre at other times so feel free to drop in – no appointment needed ! 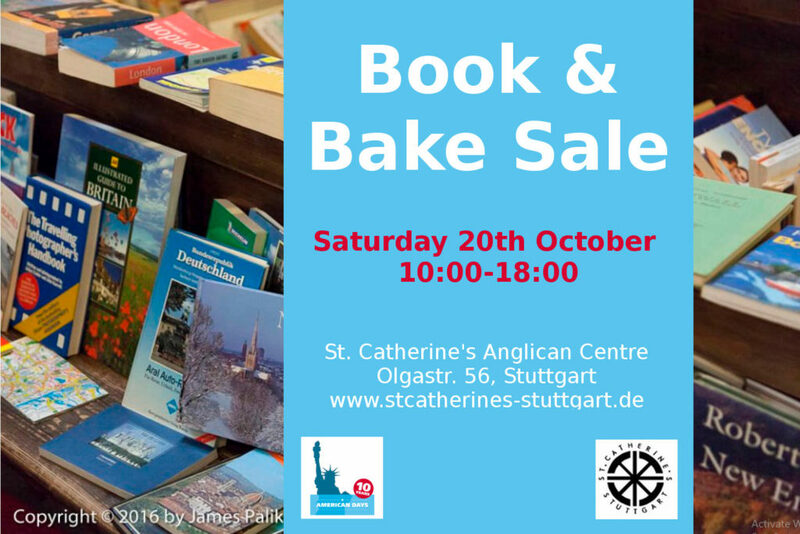 This will be a small book sale in the Anglican Centre not a full scale event in church, but helpers are still needed – speak to Gary if you can lend a hand. This month we will back to our usual third Thursday in the month, that is, Thursday, 18th October from 10 until 12 in the Anglican Centre. Last time we talked a lot about the Women’s Day of Prayer which we are hosting next March so this will be an on-going project and we would welcome your support. Ladies’ Evening Group (LEGS) Due to us all being busy, busy we are moving the October LEGS meeting to Monday 29th October -19:00 at Injeera Please e-mail legs@stcatherines-stuttgart.de or let Frances know if you are able to join us. Church Bazaar – Saturday 1st December – start planning what you can contribute or help with and speak to Alison – more details to follow.